Cohousing is an approach to creating a community. Often referred to as an intentional community, it really is just that - people living in a way that they themselves have intentionally designed. Cohousing is people coming together to build a neighbourhood that embodies particular values. These values are generally linked to a shared vision for living in a certain way. More often than not the values are around living in a way that increases connectivity, the spirit of looking out for one another and in a way that is environmentally-conscious. While cohousing has a big focus on living communally, it is different from a commune. Residents have their own homes which surround shared spaces where people can meet, eat together and share resources. Cohousing is not about forcing people to eat together every night and imposing strict rules. Residents decide when and how they want to interact. 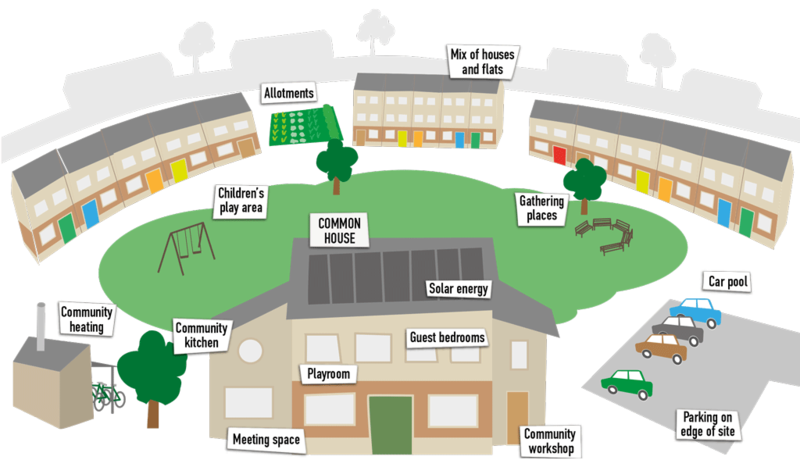 There are currently 19 lived-in cohousing developments across the UK, with more than 60 in development. The completed schemes are very different. Some are intergenerational, some focus on providing independent living for people with disabilities, and others have been created to cater for particular communities, such as older women or LGBT groups. Interest in older people's cohousing in increasing fast. With people living longer the need for homes that are built or can be adapted so people can remain independent for longer are high on the wish list. That's not all, loneliness and social isolation has increased demands on the countries social and health services too. Loneliness increases the likelihood of death by 26%. This wonderful video which was produced by Older Women's Cohousing gives an insight into what life is like at New Ground.